The feast of Emmanuel, God with us, has begun. When I look at the Nativity scene, I no longer see an empty manger; the baby Jesus is nestled there, fitting just so among the straw. 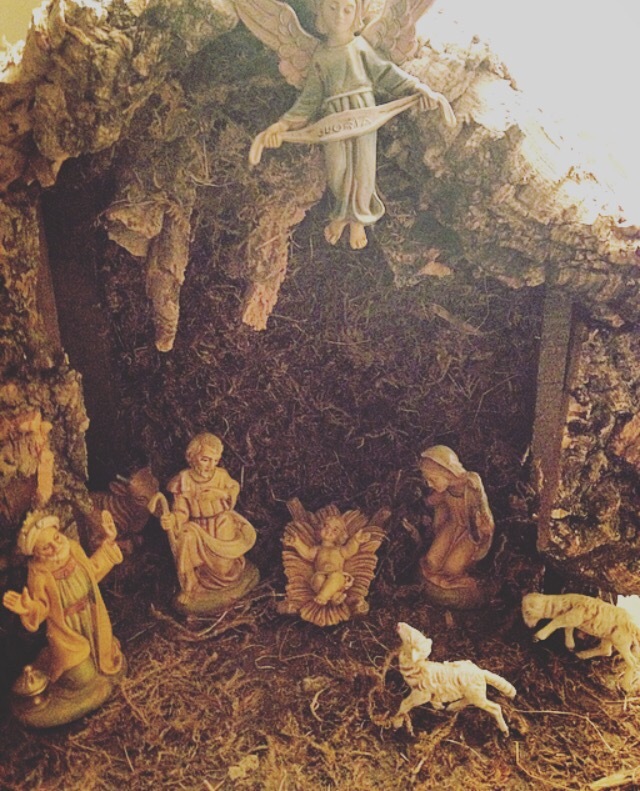 It is a reminder that God became human, a little baby, and shares every facet of our human experience. He is with us in it all, sharing our burdens and our joys. He continues to come to us through the Eucharist; He enters into our hearts and makes a home there. We are never truly alone—He is always there to keep us company. In our sufferings, He does not abandon us; He suffers alongside us in solidarity. In our joys, He leaps within us, sharing in and multiplying our joy and gratitude. Our hearts are His humble manger—messy and unfit for the King, and yet He comes to rest there. With His presence everything seems aglow in heavenly light, even the heaps of straw around Him. Let us arrange the straw as best we can to welcome Emmanuel. The Bread of Life is born in Bethlehem. He is laid in a feeding trough, offering his very body to nourish us. The word “manger” comes from the same root as the Italian “mangia”: eat. Mangia, mangia; take and eat, this is my Body, given up for you. Let us kneel before a King who chose a manger for His cradle and a Cross for His throne, let us receive Him as the Bread that will sustain us. ” Cross for His throne ” hit me with power. The mangia/manger thing was also good in a lighter way. Thank you for your faith and your words about it. I’ll share in return my specialty because as Augustine noted…the veiled prophecies of Christ are the most confirming. Augustine found many but flitted too fast past detail accuracy so e.g. on Noah’s ark, he rightly/kinda noted that it had the proportions of a man’s body ( Christ who also had a hole in His side like the ark ) because it had to be made at a measurement of 300 cubits by 30 cubits by 50 cubits. It’s more accurate especially in modern obese US times to notice that these are the proportions of a very slender person whose height is ten times his chest depth and six times his torso’s width. It may work on you but not on males at your office who have any spare pounds. But it would work on a temperate male eater who is also fasting for 40 days and forty nights….the time span of the rain during the Noah flood and the time span of Christ’s fast in the desert…40 days both. Yes the very measurements of the ark were predicting Christ and his 40 days in the desert. Unforetunately Augustine didn’t put all of his veiled “finds” in one spot. They occur in City of God and in one of his essays to a Manichaen but much later Protestants ( who also liked Augustine ) wrote also on the hidden prophecies as did Aquinas in the Summa T when he explicates how the “old law ” contained veiled meanings in the very laws. This is partly what Christ meant when He said, ” If you believed Moses, you would believe me for he wrote of me” whereupon Augustine saw most of Genesis as having veiled prophecies of Christ or Christian life…e.g. as to the latter… Jacob loves the beautiful Rachel but her father tricks Jacob into marrying the less comely Leah whereupon he works for another seven years to obtain Rachel also and is thus married to both. Augustine said you are Jacob as am I. Rachel means ” First principle made visible” and Leah means suffering…according to antique sources that Augustine had. Each Christian therefore is first drawn to the bright side of following Christ…vision/consolation…Rachel…but he encounters “suffering” instead…Leah…very soon but then the bright side returns and each of us is married to both consolation ( Rachel) and suffering ( Leah )…but we must love both as Jacob did…not just consolation. While God did not like their polygamy, He nevertheless made prophetic use of Jacob’s polygamy as a veiled prophecy of our lives with God….sweet and sour as my Chinese wife would say…Rachel and Leah. We each are married to consolation and suffering once we follow Christ. And we must love both. Now you understand why I liked your phrase ” Cross for His throne”. That’s loving Leah and that is not easy at times. ps…if you know very slender guys at work or in a Catholic youth group and you also want to initiate evangelisation of them at lunch time, bring a small tape measure to work….lol. If e.g. such are 12 inches wide just above the waist, that means you multiply by six which gives you 6’2″ for their height by the ark’s proportions. And if you measure their depth of torso at the chest or anywhere really and if it is 7.2″ then ( times ten) that also is 6’2″ tall and that makes them the proportions of the ark and of Christ. 11 inches wide at the torso would mean 5’6″ tall and 6.6 in depth of the torso would get the same height. I suspect Christ was tall for his generation so that He could be seen in a street crowd…but tall then could have been under the 6’2″ mark…or not.